With every lake cabin rental at Lakewood Lodge one free powered dock space. We have gas, oil and live bait for sale on site. 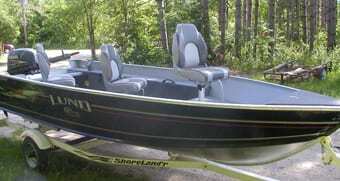 We have pontoons, deluxe fishing boats, and standard boats and motors available for rent. Due to limited availability, please call and reserve boats and extra dock spaces early. All docks have electricity. * Must be 21 years old to rent watercraft, and be 16 years of age to operate a rental watercraft with an adult present. Deposit Information: A $200 deposit is required upon reservation for all boat rentals. The deposit is not refundable if you cancel your reservation for the watercraft rented and it is not re-rented. A credit card imprint is required for damage security upon arrival. Lakewood Lodge reserves the right to substitute any boat or any pontoon for another due to maintenance or scheduling issues. Minnesota Law Requires Life Jackets. One Life Jacket per person and one accessible and throwable floatation device is required on board at all times. Life jackets and throwable devices are available for checkout at the lodge at no charge. Please ask on arrival. Gas and Oil Are Available On Site. Gas is not included in watercraft rental rate. 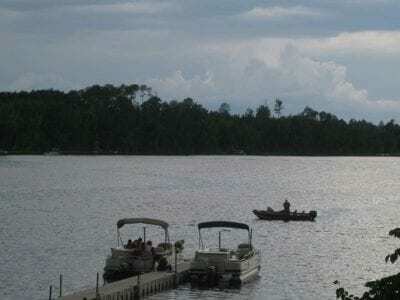 All gas for Lakewood Lodge watercraft must be purchased from Lakewood Lodge. All boats must be in by sundown. Watercraft is not fitted with required lights for night operation. Watercraft renters agree to pay full day rental fees for days noted on watercraft rental agreement and for any days that the watercraft is out-of-service due to damage caused by you or members of your party and you are financially responsible for any and all damage caused to watercraft while in your rental period. No pulling of tubes or skis or swimming from watercraft is allowed with any Lakewood Lodge watercraft. 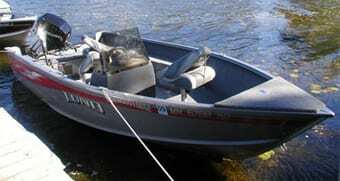 All boats can not exceed the rated weight or person capacity as posted on manufacturers tag in boat. All rentals are subject to MN state sales tax. No Jet Skis or Wave Runners Allowed without prior approval from the lodge. All watercraft operators will agree to abide by MN Boating Laws. MN Boating Law books available free at the lodge. If Lakewood Lodge does not have a pontoon available for rent during your stay we recommend giving these local businesses a try. They both have several pontoons available for rent and they will deliver them and pick them up at the resort.